Google has continually expressed their commitment to offering a full suite of solutions to the Enterprise and Education sectors and this week, that dedication is offering up a new way for businesses to lend out Chrome devices to their employees. Imagine this. You’re headed out of the office to meet a client and you left your laptop at home. Now. you have to head to IT or a coworker and try to finagle a loaner and still make it to your destination on time. Or, perhaps you manage a company where multiple employees share devices and you’re looking for an organized way to manage those machines without expending more labor hours or wasting valuable time that could be spent on a project. Google’s got you cover with their new Grab and Go program for Chromebooks. With the new Grab and Go stations, employees simply pick up the Chromebook and they’re on their way. No signing out and no interaction with the IT department means minutes saved that, over time, could save companies thousands of dollars. Once a worker signs into the Chromebook with their corporate credentials, they will receive an email with instructions on how and when to return the device as well as how to extend the “loan” time if needed. Google has already deployed the Grab and Go kiosks in some of their offices and the number of hours logged on loaned out Chromebooks is pretty impressive. To find out more about the Grab and Go program, check out the detailed whitepaper here. 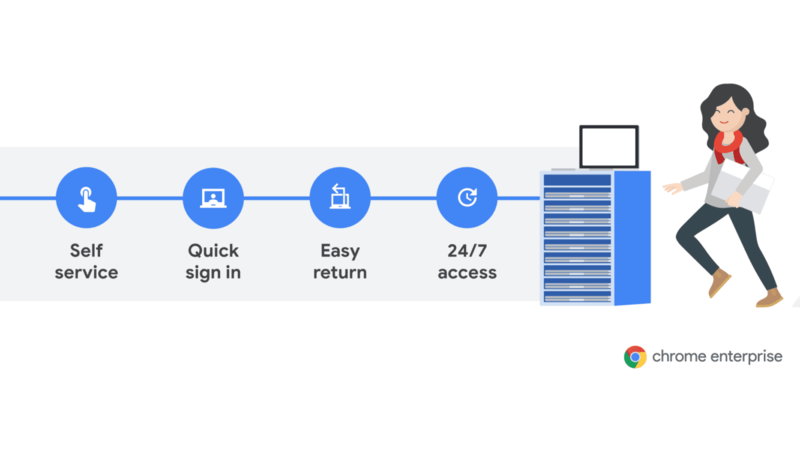 If you are a Google Cloud or Gsuite Enterprise user and would like to get a jump on the program, you can sign up for Early Access here.